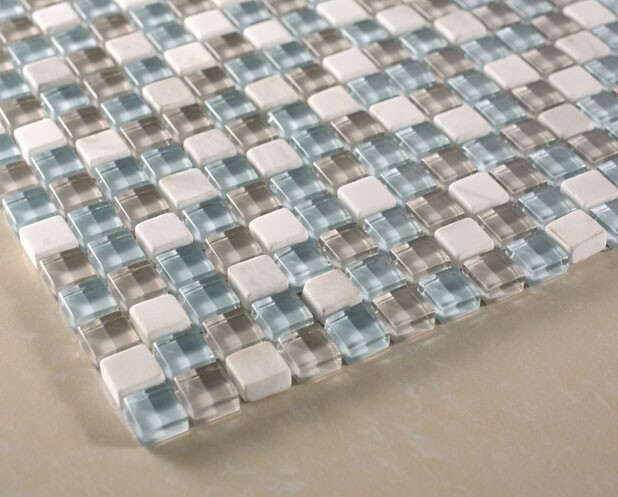 Buy Quantum Seascape 5/8" x 5/8" Mosaic Glass Tiles Meshed on 12 x 12 Sheet, Bathroom Walls, Kitchen Backsplash, Shower Walls, Living Room Floor from marblenthings.com Online Store. Beautiful tile, photo true to colors.High quality, well packaged. 2nd time order from them. Quantum Seascape 5/8 in. x 5/8 in. 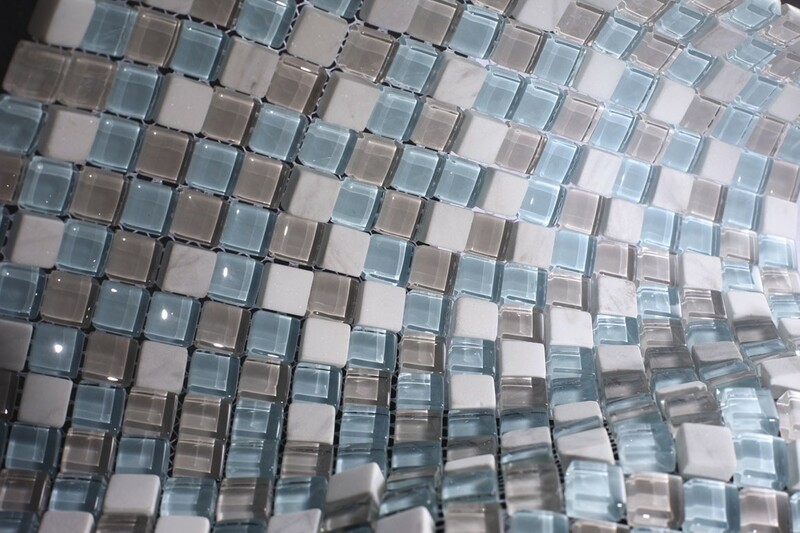 Mosaic Glass Tiles for Bathroom Floor, Kitchen Backsplash, unmatched quality, expert advise available at marblenthings.comThese stunning mosaics are mesh-mounted and give a unique and dramatic effect. This tile can be used alone or as a gorgeous complement to ceramic and natural stone materials. The combination of the white, gray and black give of a modern and contemporary feel to the room.Minimum purchase quantity to get free shipping is 13 sheets.Chip Size: 5/8 in. x 5/8 in. 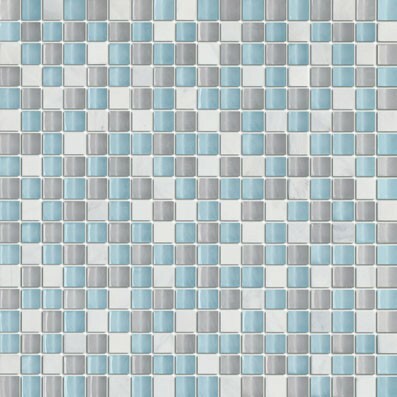 Color: Blue, White & Grey Material: Glass & Stone Finish: Glossy & Honed Sold by the Sheet - each sheet measures 12 in. x 12 in. (1 sq. ft.) Thickness: 8mmDisclaimer: Tile view in picture 1 (Main Product Image) has been installed using white grout but tile view in image 2 or 3 (Side Views) have been placed against a grey background. Please make your color selection keeping in mind the shade variation in the pictures. Due to the transparent nature of most of our tile please consider choices carefully. Tiles are handmade so variations in color and texture are to be expected. All tiles should be inspected before installation, as no adjustment will be made after installation.Maintainance: Abrasive cleaners should not be used. Use a glass cleaner such as Windex and a lint free soft cloth.